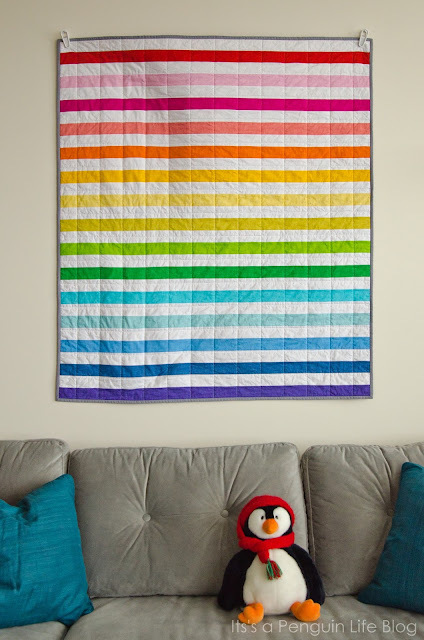 It's a Penguin Life: Rainbow Baby Quilt, my first quilt sale! 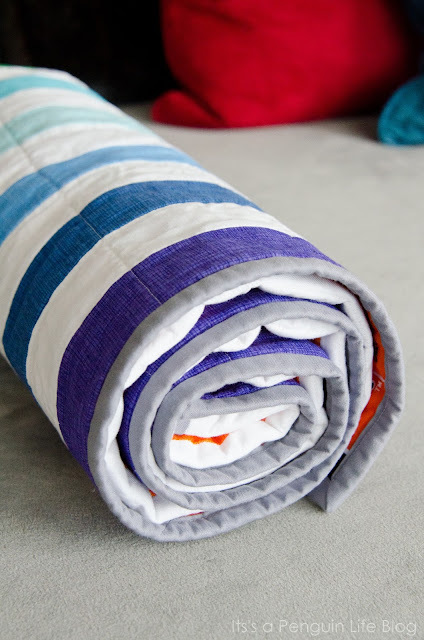 Rainbow Baby Quilt, my first quilt sale! EEP! 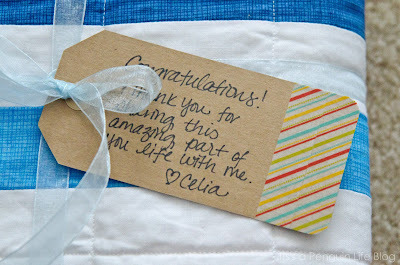 My first quilt sale!! Made with 100% cotton designer fabrics. Filled with 100% cotton batting. Machine sewn with 100% cotton thread. Machine washable (cool wash, tumble dry low). The front: Alternating rainbow stripes. White fabric is Robert Kaufman Kona in white. 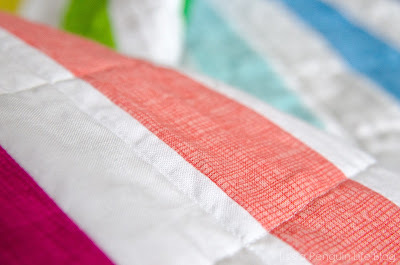 Rainbow fabric is Sketch by Timeless Treasures. Close up of the Sketch. Surprise, it's not solid! I love how the tone on tone print gives it a faux texture. The back, aka, La Pièce de résistance: Oregon State University print! The parents to be are both alumns of my alma marter, so I wanted to surprise them with some special. A close up of the quilt back. Go Beavs!! I was patting myself on the back for my near perfectly mitered corners. The binding is Kona in Grey. The other side of my binding job (all machine sewn). You can ignore the not so straight horizontal quilting line. Obligatory photo of the quilt rolled up. 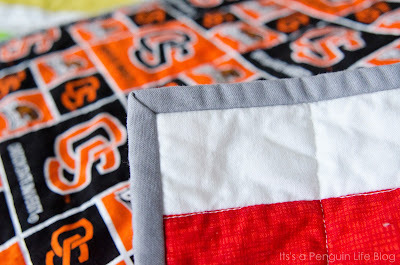 I don't get it, but I see it done on every quilting blog. 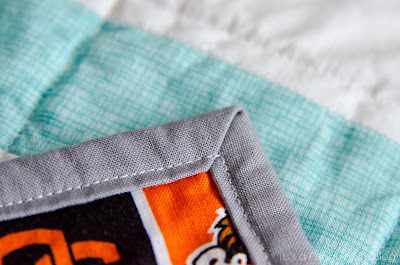 - Using a cheater print (OSU fabric) is not as easy as one would think. I had a hell of a time trying to line up the horizontal stripes on the front with those on the back. 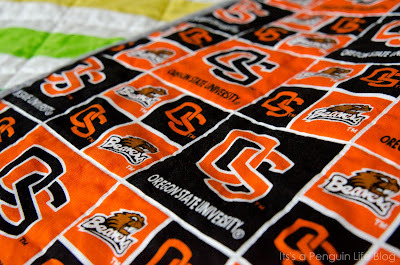 Contact me if you are interested in commissioning a quilt from me. I'd love to work with you. Love seeing the close up shots, it looks so good! I just bought TT sketch in lipstick. My favorite! I was thinking of backing/binding with it. 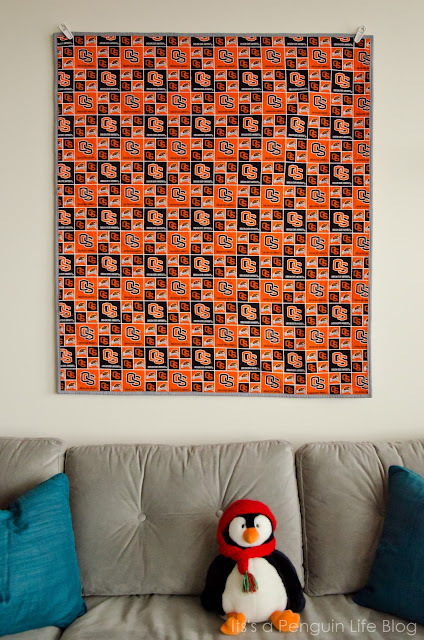 Your quilt is super! Copyright © 2009-2014 It's a Penguin Life. All rights reserved. All images are property of Celia Hung unless otherwise stated. Please do not use any images without proper link back to this site.